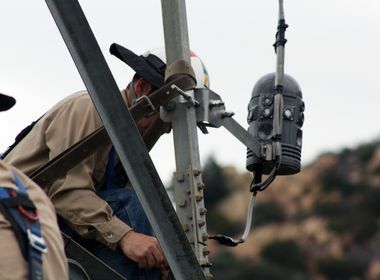 An SCE crew installs a FlameSniffer on a transmission tower in Santa Barbara County. An SCE crew prepares a FlameSniffer for installation. The FlameSniffer, new, cutting-edge fire detection equipment, can help prevent injury and destruction by providing early warnings. Droid-like, early-warning devices will stream live data on fire conditions in mountains above Santa Barbara. 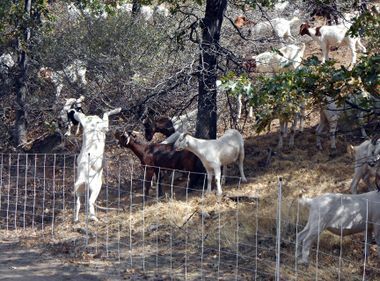 One evening in May 2009, strong winds known locally as Sundowners rushed down the Santa Ynez Mountains in Santa Barbara County, fanning flames that are believed to have been started earlier that afternoon by workers clearing brush. The resulting Jesusita Fire roared through Mission Canyon and surrounding communities for nearly two weeks. 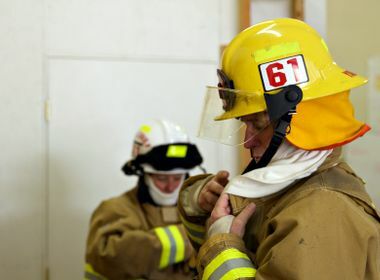 When done, the fire had burned 8,733 acres, destroyed 80 homes and injured 30 firefighters. Five years later, because of a groundbreaking partnership between Southern California Edison and the Santa Barbara County Fire Department, there is hope that new, cutting-edge fire detection equipment recently installed on the utility’s transmission towers can prevent injury and destruction by providing an early warning if such a fire erupts again. “This program couldn’t be more important than it is now in the extreme drought,” said retiring Santa Barbara County Fire Chief Michael Dyer, who is responsible for spearheading the yearlong pilot. Last summer, conditions from the ongoing drought resulted in heightened fire restrictions in the area. SCE crews recently attached nine “FlameSniffer” devices, which bear a striking resemblance to R2-D2, to towers high in the mountains above Santa Barbara. The cylindrical, dome-topped devices aren’t equipped with as many problem-solving gadgets as the celebrity droid, but they can still do a lot, Dyer said. Soon, the devices will stream live data to communications hubs at Mission Canyon fire station and the county’s fire dispatch center. The data will also be available online to firefighters, aerial teams and SCE fire personnel. FlameSniffer CEO Cam McKenna, who was on hand for the installation, said SCE’s cooperation is critical to the pilot’s success. McKenna added that this is also the first pilot site for this type of ground-based, fire-prevention technology in the United States, as well as a first for a fire department or a utility to proactively combat wildfire through early detection and year-round climate analysis. SCE Fire Management officer Troy Whitman, who was responsible for SCE’s involvement in the partnership, says the FlameSniffer pilot will benefit not only residents of the Mission Canyon area, but all SCE customers as well. The pilot required cooperation between SCE and the Santa Barbara County Fire Department, as well as agreements with the U.S. Forest Service and owners of adjacent private property. FlameSniffer is funding the $400,000 cost of the pilot, which includes $260,000 worth of equipment.